All in camera, single exposure lighting painting drawn with one bulb torch, one CREE LED and a 77mm red filter. And a decent pair of wellingtons. Please do check it out in Lightbox – looks more compelling on black. It’s taken in the middle of the River Colne in Mill End. 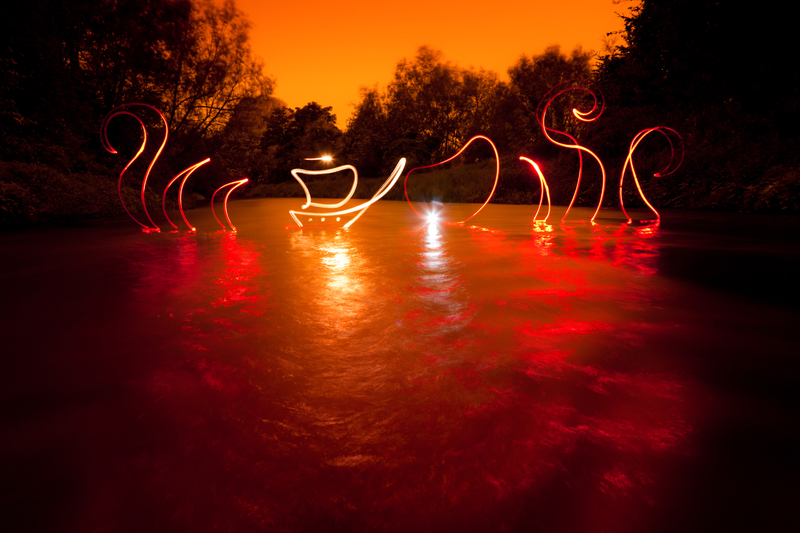 Light painting in the river is actually far more relaxing than you might imagine. The main worry when light painting in desolate locations at night is the fear that some misguided nutter with a hand axe will ambush you, drawn like a moth to your flailing lamps. This spot is a hundred yards along from any accessible bank, so you are screened by vegetation on all sides, out of sight, with a sizeable moat all around. Defensible. “Totem – get back here this minute. If you’ve killed another fox/moose/commando you’ll be sleeping in the kennel tonight, you hyper-aggressive, 200 lb mongrel you.” You get the idea.